I'm sure you guys are getting really sick of hearing about Night of the Living Dead Christian all the time. While you love the shiny new thing, you are also filled with a nostalgic twinge of sadness thinking of a simpler, more innocent time when I only had one book and all I ever talked about was how King James Jesus made me laugh with his silly anachronistic comments. 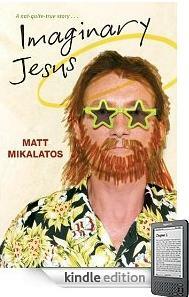 1) Imaginary Jesus e-book is free for a couple more days. Wherever e-books are sold. Which is to say, primarily on the internet. 2) You may recall that last May I spoke at Clayton Community Church for what was supposed to be a few week series about "Imaginary Jesus." The pastoral staff enjoyed talking about our misconceptions about Jesus so much that the series became a TWELVE PART JUGGERNAUT! I thought you might enjoy listening to some of the talks, which are here. Fun fact: three of the speakers are people I've known for some time. Rick Nylund was one of Krista's youth group staff, is a good friend and actually performed part of our wedding ceremony! Dr. Shawn Robinson was the leader of my InterVarsity club in college, and Sara Goetz and I went to high school together! 3) Remember back in the day when I would always post interesting reviews of IJ? Here's a recent one from a lovely woman who has four beautiful adopted kids. Enjoy. 4) I've been waiting to tell you about some of the big changes coming for Imaginary Jesus. Mostly because I want to make sure that the new baby, NLDC, gets plenty of love, and there's nothing like the first born wanting to show off to take away attention from the new baby. But suffice it to say that IJ is getting a new name, a new cover and a new unveiling very soon because, you know, it was waaaaay back in 2010 when it first came out and we want to update that bad boy for 2012. Yeehaw! More details soon. But if you can't wait, a little internet snooping will reveal all. Does anyone else have "Glory Days" by Bruce Springsteen stuck in their head? Man! Knock it off, Boss! Loved both books and waiting for a third which better be good and available soon to a bookstore near you. Feel pressure about this. Ha ha ha. When you say "feel pressure about this" as an anonymous comment, it can really creep a guy out. Okay... I was going to go to bed but now I feel like I better go work on the third book!